This field guide is designed to give the reader experiences of expanded and healing states by connecting with the powerful energetic presence of nature. It brings the mystical down to earth. 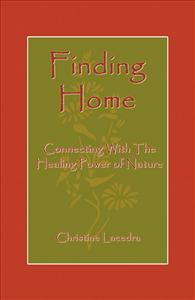 ‘Finding Home’ is a practical, easy to use field guide that assists the reader in experiencing expanded and energized states by connecting with the powerful energetic presence of nature. Nature is a perfect embodiment of spiritual energy and can help bridge the gap between our spiritual and material existence. By following the easy to use ‘Try this’ exercises, the reader is guided into having direct & personal experiences of the expansive and healing presence of nature. A simple practical, hands-on book that gets to the point. It helps me to really re-discover my self within. The exercises can be used in a small amount of time for centering. A great book to keep close by.